Philadelphia’s Brian Sokel has played in numerous bands throughout the years, most notably the rhythm-centric, post-punk band Franklin. After recording Franklin’s final release, Sokel found himself working on four-track recordings of songs that didn’t fit into the mold of Franklin’s sound. After accumulating several cassettes of these four-track demos, Sokel brought aboard old friend Michael Parsell (Frail, Goodbye, Blue Monday, The Science Of) to add dimension to the then, acoustic only, songs. Following the release of Audiot, Brian and Michael began writing and arranging songs to create what would become their first full-length album. Nearly a dozen musicians, all from local Philadelphia bands such as Aspera Ad Astra, Franklin, The Science Of, The Unfixers, and Lenola assisted in creating a 13-song, multi-layered slice of time. 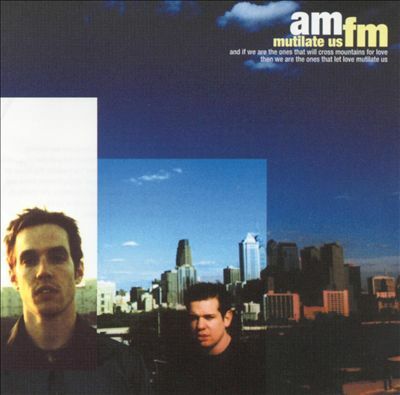 Mutilate Us was released March 2001 to much critical acclaim followed by tours with American Analog Set and Rainer Maria. AM/FM returned in 2003 with the four-song The Sky is the New Ground EP which features dense pop arrangements, huge guitar symphonies, and strings. After the release of The Sky is the New Ground, Sokel continued to write songs but AM/FM became an inactive studio project, having left two magical albums and an EP.